21 Romilly Street was previously the home of Richard Corrigan’s Lindsay House, a restaurant that I enjoyed immensely and preferred much more than his current venture, Corrigan’s. But whilst I liked the food, I was never enamoured with the building itself. A 4-storey Soho townhouse, it is narrow and tiny. Lindsay House closed last May, and the site was taken over by Alexis Gauthier, who recently left his post as head chef at one Michelin starred Roussillon. I believe the reasons for the move are complex, but from what I could gather from our waiter, Alexis now becomes proprietor as well as chef. This is a serious move as he took his sommelier from Roussillon to Gauthier Soho as well. The dining room is sparsely finished, and with the all-white walls, the space feels formal and stiff. I also found the acoustics ill-judged. Early on in the evening, with only 3 seated tables, the room was deadly quiet. This meant that S and I ended up whispering. Girlie gossip is not something that you necessarily want to share with strangers. Later on, when the restaurant became busier and noisier, we struggled to be heard. But I really wasn’t that bothered. Roussillon was a one star, and by deduction, I figured that the food at Gauthier’s new venture must also be pretty good. The menu seems reasonably priced too, 3 courses for £35, 4 courses for £45 and 5 courses for £55. I have been wanting to go to Gauthier Soho for a couple of months now, and just as I was about to book, I discovered with great delight that the restaurant was offering a 2 for 1 deal on the tasting menu through Toptable until the end of August. Normally priced at £68, paying £34 a head seemed like a steal. 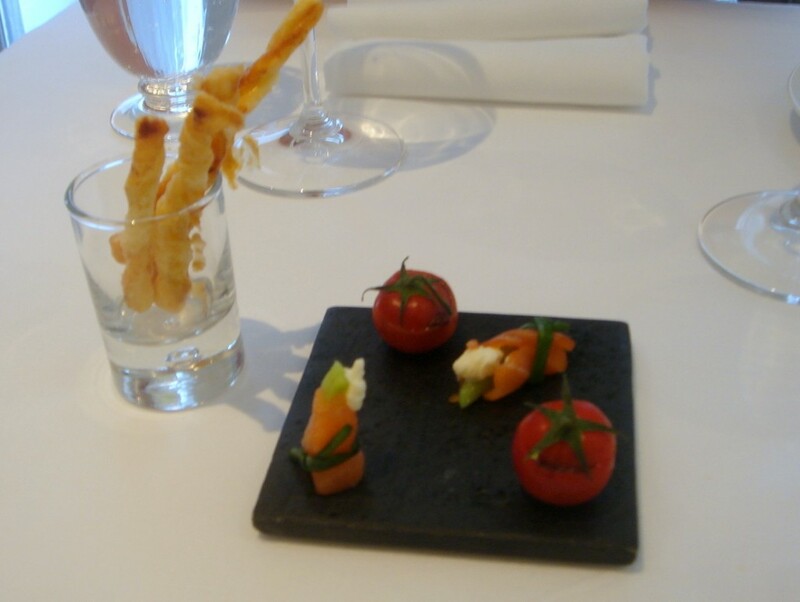 To start were amuse bouches of cherry tomatoes stuffed with olive tapenade, smoked salmon rolled with cucumber and lemon cream, and cheese twists. The latter was the best of the lot with its light, flaky texture. 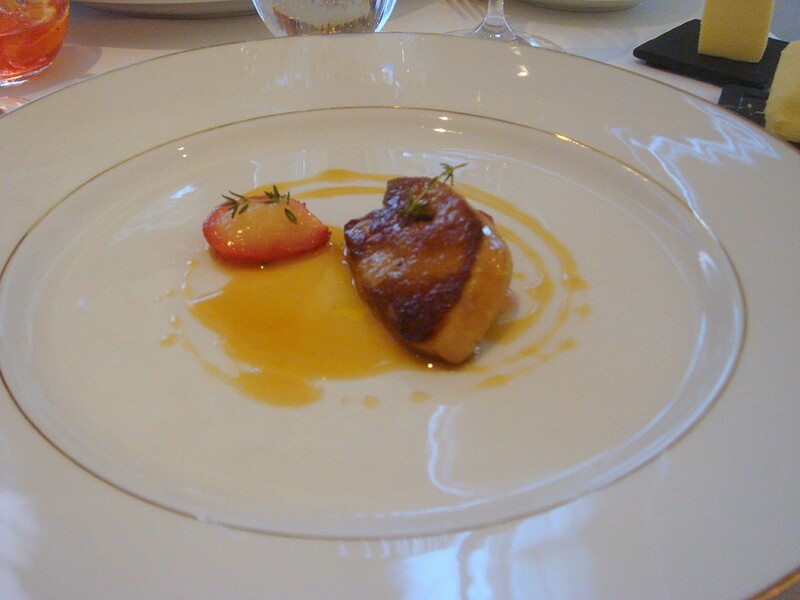 The first course was pan-fried foie gras with confit apricot and a verjuice reduction. The foie gras, with its silky texture, was exquisite. The softness and light acidity of the apricot worked well with the decadent unctuous quality of the liver, and the verjuice added a further spark to this elegant dish. 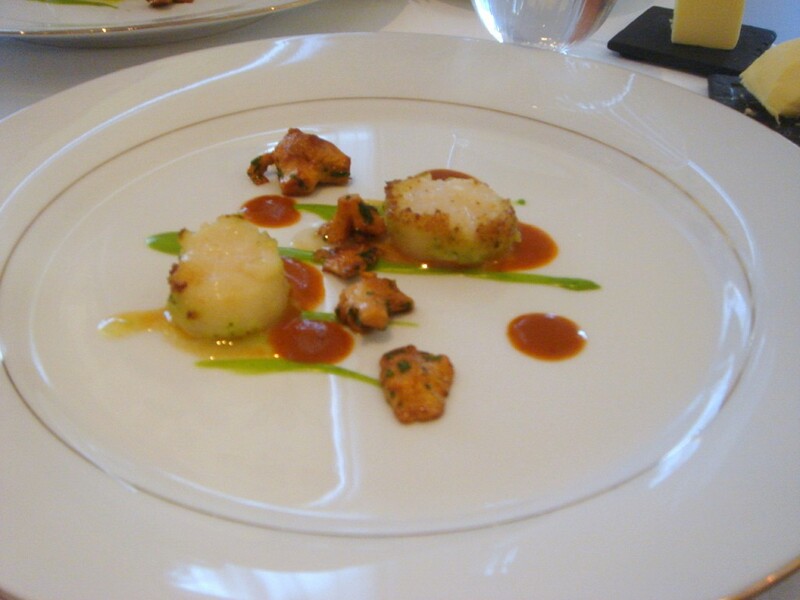 Scallops coated in finely chopped wild garlic and served with parsley puree and a ‘crustacean’ sauce was also divine. The flavour of the garlic was very gentle, and worked wonderfully with the delicacy of the scallop. The puree did not overpower the dish, and the crustacean sauce, with its hint of cream was very flavoursome. Meaty chanterelles finished off the dish nicely. 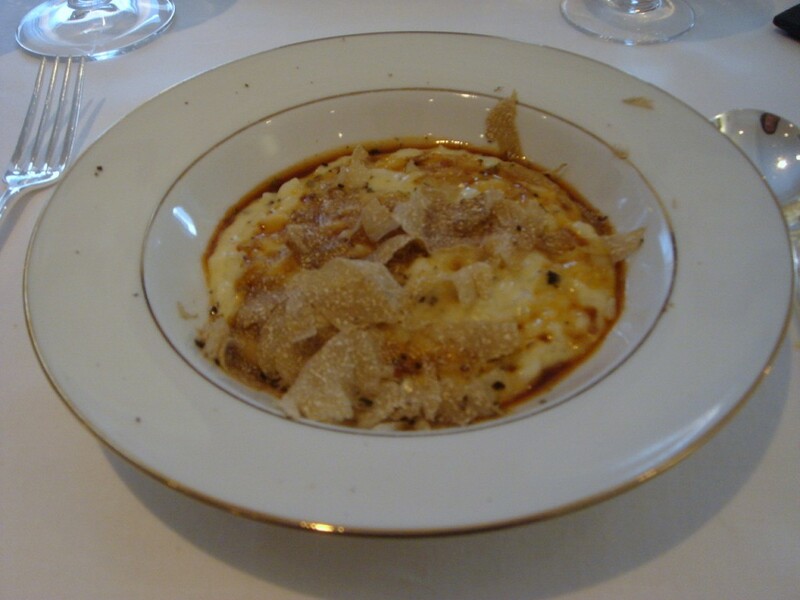 Summer truffle risotto with jus de roti and parmesan reggiano was generously topped with truffle. The jus, with its intense concentration of flavour, lifted the dish to glorious heights. The risotto was al dente with a bit of bite. This was also another lovely dish. 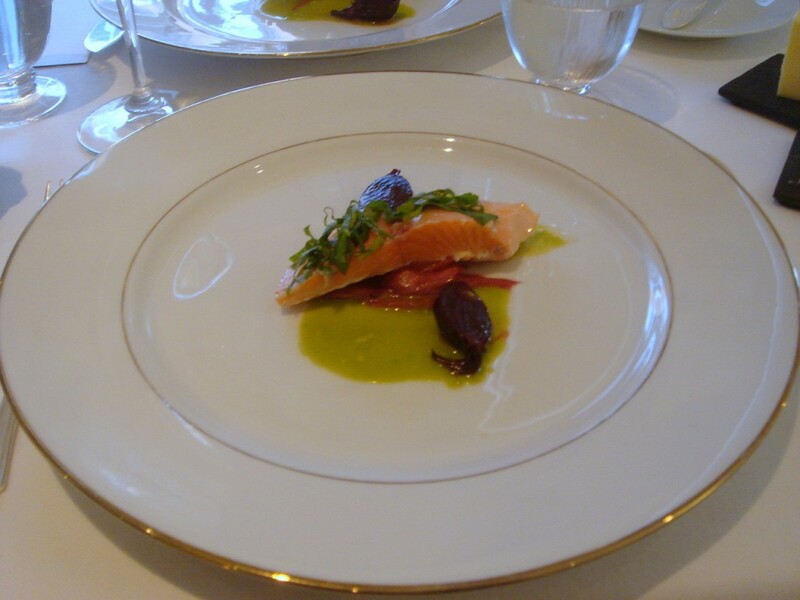 Wild sea trout with beetroot, sorrel jus and light ginger was very pleasant, although this course did not quite match the finesse of the preceding courses. The gently pickled ginger and the sweetness of the beetroot worked well with the freshness of the fish. 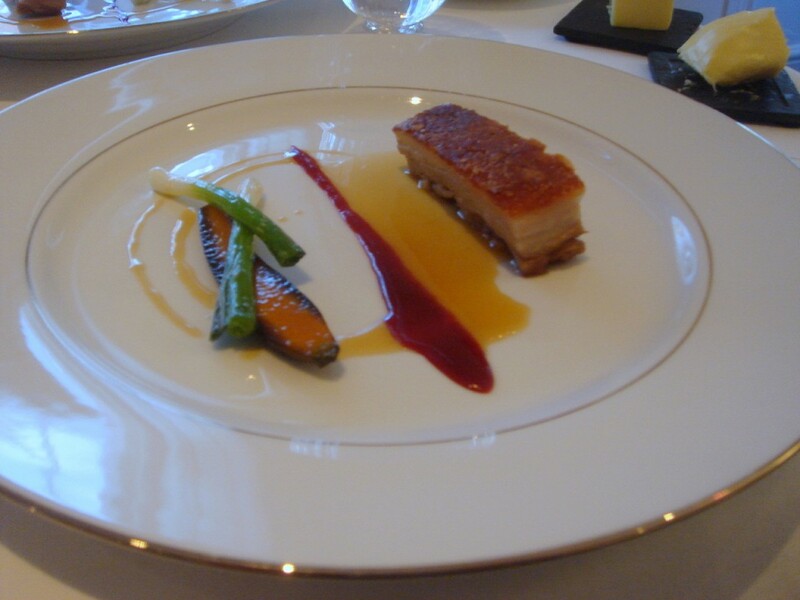 Crispy and soft piglet with red plums and pig jus came with the crispiest of crackling and pork that wasn’t too fatty. The wonderfully reduced pig jus and sweet plum worked well the meat. Vegetable accompaniments, which included baby leeks and charred carrot, were nice but a little dull. Breads included wild garlic, raisin, poppy seed, brown, tomato and basil, and white baguettes. 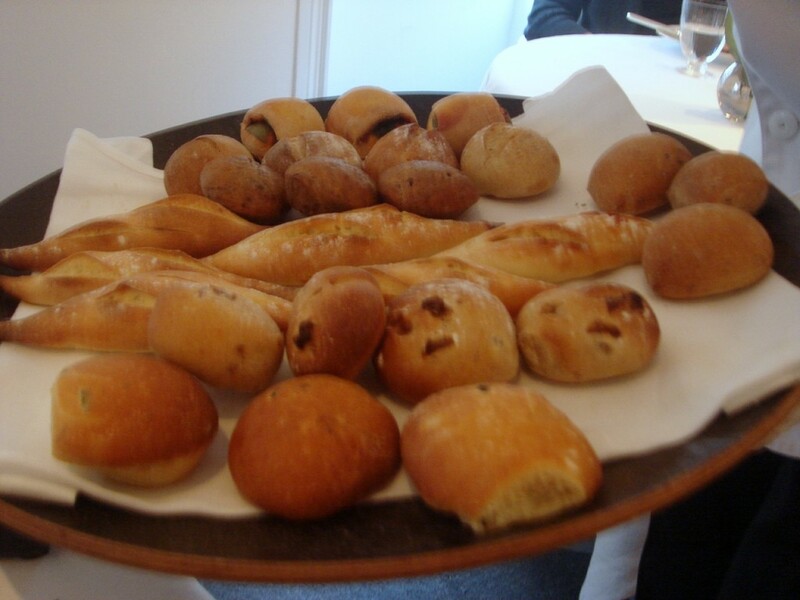 The breads were of a high standard, and of the several I tried, the wild garlic was the tastiest. Next up was the cheese course. The fantastic looking cheeses came out on a trolley – all 14 of them – and somehow I found myself asking if we could have one of each to share. 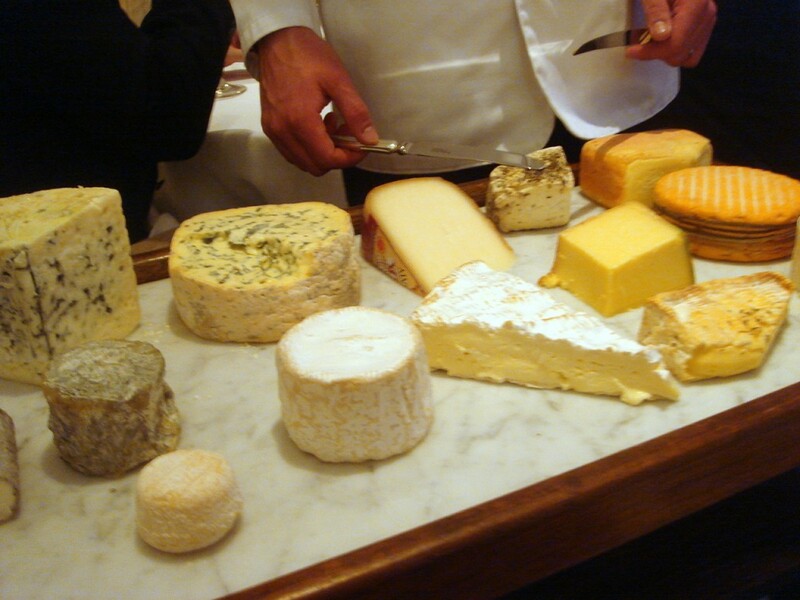 In a generous display by the restaurant, they agreed, so we found ourselves tucking into 14 cheeses. Were we being pigs? Yes, but it was well worth it. The last cheese we tried was the Roquefort which was spectacular. Intensely flavoursome and creamy at the same time, this was a great cheese to end with. With all these courses, and all these cheeses, it was hard to believe that we were only paying £34. Pre-dessert consisted of cherry and dark chocolate, cherry and red wine jelly, and cherry jam with champagne granite. I liked the idea of the cherry tasting more than I liked the dish itself. It wasn’t bad, but it failed to enthral. 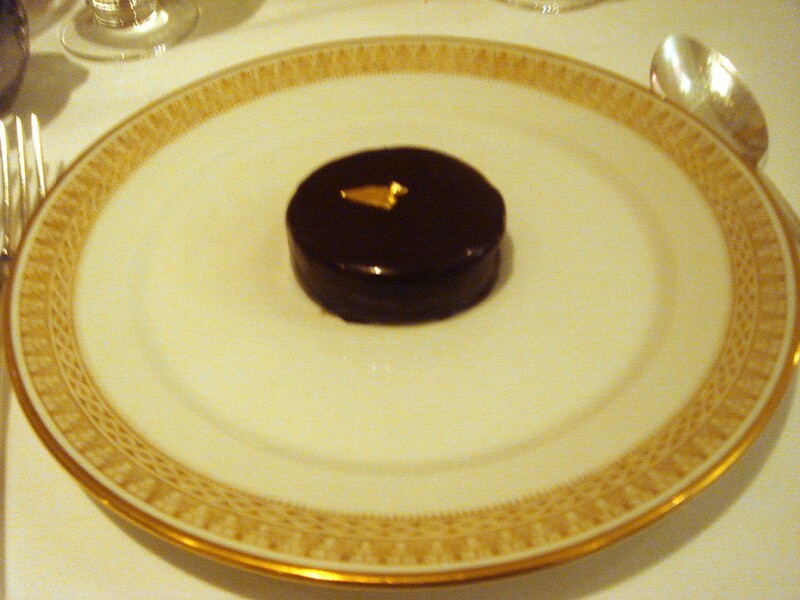 In homage to Alain Ducasse, the superstar chef who Gauthier trained under at Le Louis XV in Monaco, dessert was the signature golden Louis XV dark chocolate and praline. I’ve not tried the original, but I imagine this was every bit as good. The dacquoise merginue base was delightfully moist and a little chewy, and the combination of rich praline and soft chocolate was magical. The only thing that was disappointing was the presentation. The dessert sat on its own, whereas the same dessert in the a la carte menu ordered by another diner came with a much more elaborate presentation. The tasting menu also included coffees and some excellent petit fours. Coconut marshmallows with roasted coconut tasted like a tropical delight, and lemon macaroons were zingy like a good lemon tart. Raspberry and chantilly cream tarts boasted of ripe, sweet fruit. But the best of the lot was a nutty, chocolate-y biscuit made with a mixture of roasted hazelnuts, pistachios and almonds. It was so good that we asked for seconds. This was excellent cooking matched by outstanding, generous service. The foie gras bordered on the exquisite, and the scallops were outstanding, and although it was perhaps not the most innovative menu I’ve ever eaten, the cooking was top-notch. Also note that in another show of generosity, Gauthier Soho does not charge for sparkling or still water. Now how many restaurants in London do that? For the quantity and quality of food that we had, £34 was exceptional value. This must surely be the deal of the month, so get in and book it through Toptable before it expires at the end of August. And at the usual £68, I still think the tasting menu is fairly priced. I can’t think of a better time to eat at a restaurant then when a chef is aiming for their next Michelin star (as confirmed by our waiter), and I imagine Gauthier will be trying to impress between now and January. The décor might be a bit dull, but who cares? Prices: Listed above. Excludes drinks and service. Wow, that really *is* a deal, and hilarious you asked for one of each cheese! I know, I am such a pig! I was too embarrassed to put up the photo of the plate with 14 cheese on it. That is an outstanding deal for good quality food. Gonna look to see if I can get in on the action too. Just went last night, thought it was a great meal. Thanks for the head’s up. You’re welcome. Glad you enjoyed it. I always get so excited about special meals like these. I’m so glad you went here and wrote this place up! They weren’t open yet when I left London, and I’ve been wondering how they were, and looking forward to trying it next Spring! Too bad about the poor accoustics. I hate noise when I’m dining. Don’t you think the presentation is a little, erm, clumsy looking? I think your comment is a little harsh. No I didn’t think the presentation clumsy. But I did think that the presentation of the dessert was boring! I’m publishing my write up tomorrow (I think–maybe Weds) and it couldn’t differ more from yours. The service was so oustandingly bad and slow that I barely remember the food. Except for the risotto. 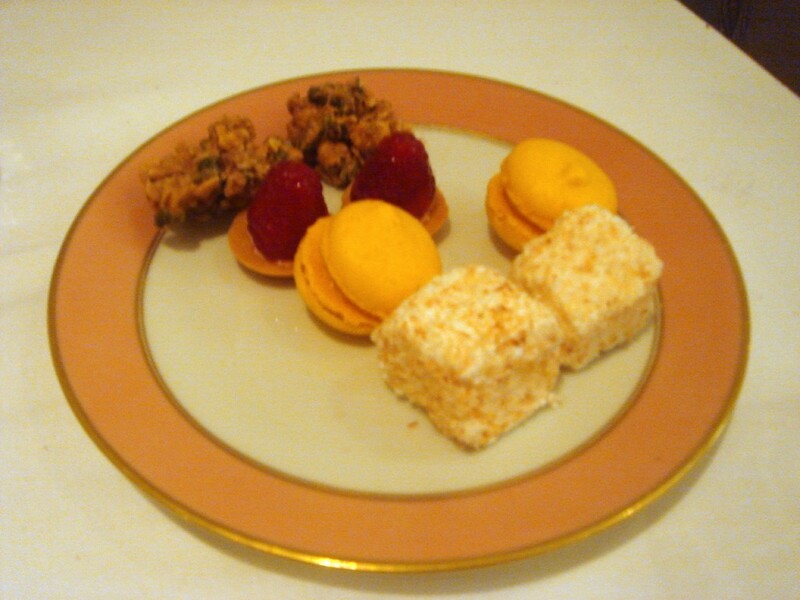 We did not do the tasting menu–just ordered 2 or 3 dishes each–and still got the petit fours. They even boxed up extras for us at the end of the night, which I thought was sweet. Would agree on the good value though. We got out at 60 quid a person which wasn’t bad considering apertifs and 2 bottles of wine for a table of 5.